Older news stories are available here. Current news stories are available on our main news page. Are you looking to get into the fastest growing industry in WA? North Metropolitan TAFE is giving you the opportunity to complete either a Certificate II in Introduction to Aged Care (52841WA) or Certificate II in Introduction to Disability Care (52840WA) whilst participating in work placement with industry partners. The program will give you an introduction to the job role, help you confirm if the career is right for you and increase your chances of continuing onto further study or employment within the industry. Aged Care Workers provide personal, physical and emotional support to older people who require assistance with daily living. 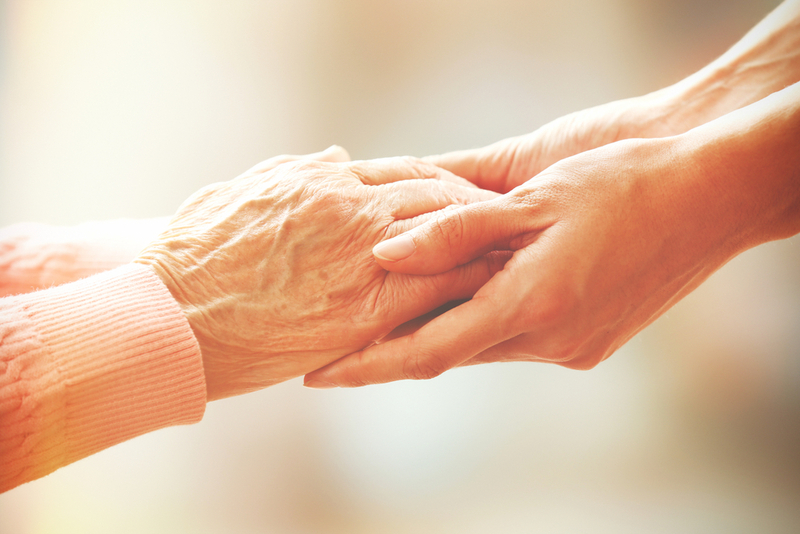 When you provide support to older people you are able to make a tremendous difference to their quality of life and achieve real personal satisfaction through your work. Aged care work is rewarding in itself and provides the opportunity to meet a wide variety of older people. Education and Training Minister Sue Ellery launched the Priority Start Policy effective 1 April 2019. The new policy meets the State Government's Plan for Jobs commitment to maximise opportunities for apprentices and trainees on all major State Government funded building, construction and maintenance contracts. Chaired by Chris Hall, AM the Social Assistance and Allied Health Steering Workforce Strategy calls for a coordinated response to maximise the development and growth of a contemporary, skilled and flexible workforce to meet the growing needs of vulnerable people living in Western Australia. The report identified the number of disability and aged care support workers needs to double over the next five years, and the vocational education and training (VET) sector must provide training that meets the needs of this workforce. Considering the current environment, the report highlighted it is likely the social assistance and allied health sectors will face challenges sustaining a skilled workforce. Streamlining training pathways to provide flexible employment options for students, and enhancing the quality of training through a stronger focus on partnerships between TAFE and local employers are options to make the VET sector more accessible to industry and the public. To view Social Assistance and Allied Health Workforce Strategy. Broome Jobs and Skills Centre is open! The Broome Jobs and Skills Centre (JSC) was officially launched by Education and Training Minister Sue Ellery on Friday 22 March 2019. The centre has been open since November 2018 and is supported by career services from Wunan Foundation. To date, the Broom JSC has provided practical advice on training and employment opportunities to more than 85 individuals across the Kimberley region . If you would like to know how Broome JSC can help you, follow this link. Certificate III in Civil Construction (Traffic Management) has been approved by the Minister. The certificate will be delivered through a training contract. REMA Tip Top Industry Australia have submitted a Notice of Intent application to establish an apprenticeship in PMB Plastics, Rubber and Cablemaking (PMB30116 - Certificate III in Polymer Processing). 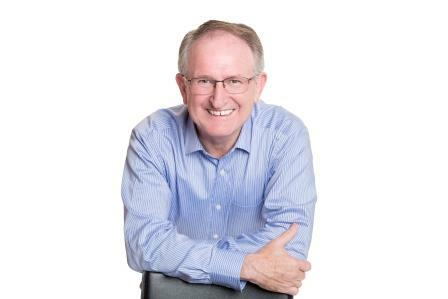 If you would like to contribute industry feedback, please contact Nigel Haywood at Resources Industry Training Council at https://www.ritcwa.com.au/. WA Training Awards 2019 - Applications now open! 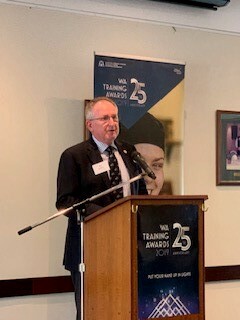 Jim Walker, Chair, State Training Board, spoke today at the launch of the 2019 WA Training Awards held at Bentley Pines Training Centre, South Metropolitan TAFE. The WA Training Awards showcases and rewards best practice and excellence in the WA training sector. Entries are now open to apprentices, trainees, vocational students and trainers, training organisations and employers. Award winners will be announced at a presentation ceremony on Friday 13 September 2019. To access more information on how to enter the WA Training Awards, click here. Strategies to grow apprenticeships and traineeships is the culmination of Statewide industry forums hosted by the State Training Board between August 2017 and March 2018. The consultations helped the State Training Board to understand what industry needs from the State’s training sector and inform future strategies. The State Training Board set out to understand Western Australian industry needs and understand the common issues and barriers that employers face when employing apprentices and trainees. It is evident that there are wide-ranging issues and diverse opinions about what is needed to help grow apprenticeships and traineeships. There are cost pressures associated with the employment of apprentices and trainees. Apprenticeships and traineeships are not widely promoted or understood by young people and the community. 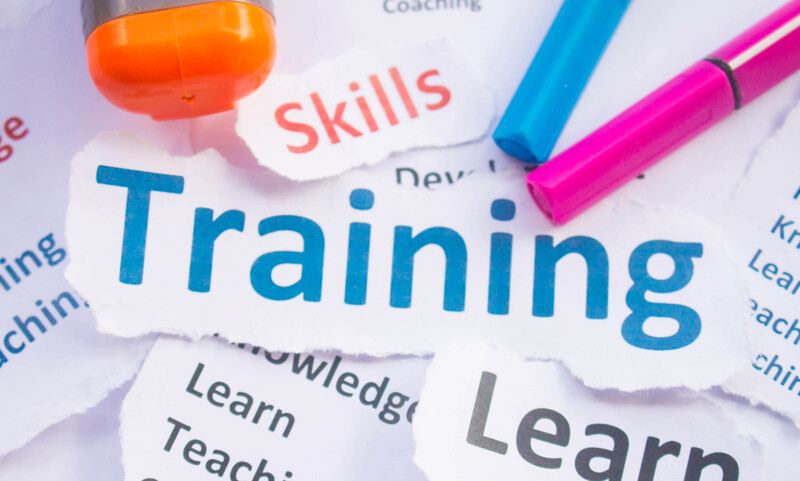 Businesses want greater flexibility from the training sector. Jobs and Skills Centres need to collaborate with industry and VET stakeholders to support users of the system. As of 29 November 2018, the Department of Training and Workforce Development accepts trade certificate applications from interstate trained and qualified tradespeople. Please refer to the application form and fact sheet, Applying for a Western Australian trade certificate by interstate tradespeople for further information and eligibility requirement. Contact the Department’s Apprenticeship Office on 13 19 54 if you have any queries. 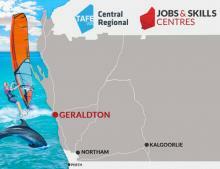 Jobs and Skills Centre in Geraldton is now open! Located at Central Regional TAFE, Geraldton campus, the JSC will provide free professional advise on training and employment opportunities in the local area. 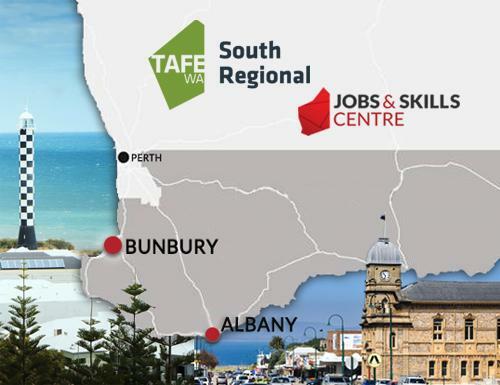 Central Regional TAFE is now home to Northam's new Jobs and Skills Centre (JSC). A one-stop-shop for training and employment advice, the Northam JSC also offers assistance with job application and CV/resume writing. Further information on the Northam JSC is available here! The Australian Government will be undertaking an Expert Review of the VET sector led by former New Zealand Minister for Tertiary Education, Skills and Employmnet, Steven Joyce. The review will focus on the effectiveness the VET sector provides to all Australians to ensure a successful working life and, the skills and support provided through the VET sector to small, family, regional and rural Australian businesses supporting their continued growth. To find out more on the Vocational Education and Training Review, click here. A revised Apprenticeship and traineeship policy has been released after extensive consultation with stakeholders. The new policy will simplfy the apprenticeship and traineeship process for apprentices, trainees, students, parents, schools, employers and RTOs. Follow this link to find out more about the revised policy. Karratha Jobs and Skills Centre open! 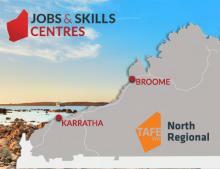 North Regional TAFE is now home to the new Karratha Jobs and Skills Centre! Practical and professional advice is offered on employment, training, apprenticeship and traineeships aswell as information on how to find a job and local employment opportunities. The Karratha Jobs and Skills Centre is supported by career services from Empowering People in Communities (EPIC), and Aboriginal services, Bloodwood Tree. Click here to learn more about what the Karratha Jobs and Skills Centre can do for you and your career! Bunbury Jobs and Skills Centre now open! The new Jobs and Skills Centre (JSC) is now open at South Regional TAFE Bunbury! Together with the Albany JSC, free professional training and employment advice will be available to all south west members of the community. The JSC helps with apprenticeship and traineeship guidance, finding a job and provides a link to local industry and business opportunities. Click on this link to find out how the Bunbury Jobs and Skills Centre can help you! Congratulations to the WA winners at the Australian Training Awards 2018! The Australian Training Awards, which honours and celebrates the achivements of the vocational education and training (VET) sector, was held in Sydney on 15 November 2018. The State Training Board congratulates the finalists and Western Australian winners of the Australian Training Awards 2018! Proposed changes for modernising Training Package Products in the context of online and social media engagement skills. To access the Final Case for Change, please CLICK HERE. Hon. 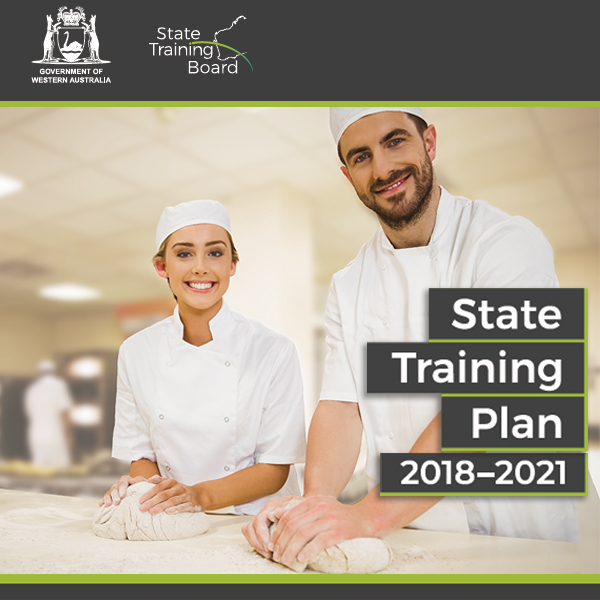 Sue Ellery, Minister for Education and Training has endorsed the State Training Board's State Training Plan 2018 - 2021. The priorities in the Plan inform funding, policy and planning decisions for vocational education and training in Western Australia. meeting the growing skill demands of WA's social assistance and allied health workforce. To read the State Training Plan 2018 - 2021, click here to download your copy. 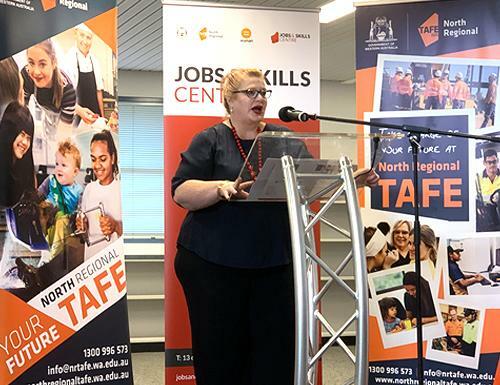 New Peel Jobs and Skills Centre was officially launched by the Minister for Education and Training Sue Ellery on Wednesday 10 October. The Peel Jobs and Skills Centre is located at the Mandurah campus of South Metropolitan TAFE, 2 Education Drive, Greenfields. Staff at the centre work closely with school leavers, youth at risk, sole parents, employers and industry to meet local employment needs. Services are delivered by South Metropolitan TAFE in partnership with South Metropolitan Youth Link and Bridging the Gap. To find more information on the Peel Jobs and Skills Centre, click here! WA Training Awards 2018 - winners announced! Congratulations to all winners of the WA Training Awards 2018! WAAMS has an online client portal allowing Australian Apprenticeship Support Network providers, registered training organisations, employers, apprentices/trainees and their parent/guardian (if applicable) to access and manage their training contracts online. Once registered, users can access the WAAMS client portal 24/7 online and can submit training contract changes via the portal, replacing the current requirement of submitting paper forms by email to the Apprenticeship Office. Where possible, change requests submitted via the portal can be instantly approved. In the WAAMS portal, users can also update their personal or organisational details and download copies of their training contract extract. For more information about the WAAMS client portal and how to become a registered user, refer to the Frequently asked questions fact sheet on the Apprenticeship Office website, dtwd.wa.gov.au/waams. 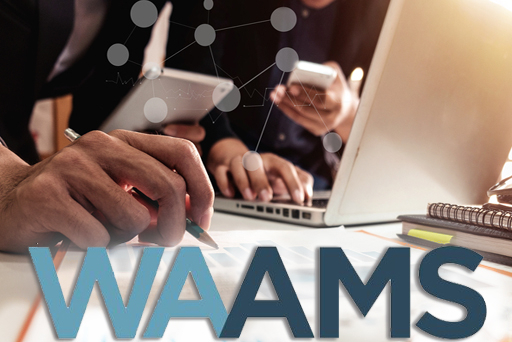 There are also a series of instructional videos available on the Apprenticeship Office website on how to navigate and perform specific actions within the WAAMS portal. If you have any questions about WAAMS, please contact the Apprenticeship Office on 13 19 54. Jim Walker, Chair, State Training Board, has been appointed to chair the new WA Vocational Education and Training (VET) alliance as part of the WA VET Collaboration. The collaboration between Rio Tinto Iron Ore and the West Australian Government will pioneer nationally recognised qualifications to meet the future needs of the mining and resources industry. The training will provide Australia’s first automation qualifications where students will acquire new skills, improve their capability and build confidence in working alongside technology. The launch of the project was announced on 4 April 2018 at SciTech in West Perth. Courses are expected to be available at Western Australian TAFE Colleges and high schools from 2019. Click here to learn more about the WA VET Collaboration.